This project addressed excessive groundwater infiltration into the Town of Farmington’s sewage collection system and replaced a failing sewage pump station. TD&H Engineering designed a new sewage lift station and inspected the installation. The Town also rehabilitated part of the wastewater collection system by lining manholes and repairing problematic cleanouts. This project resulted in a noticeable reduction in wastewater flows to the Town’s treatment lagoons. The Sewer Manhole Rehabilitation Project involved the lining of 49 sanitary sewer manholes with an impervious lining system. The manholes varied in depth from 3 to 18 feet. The project replaced the existing lift station that collected and transferred wastewater to the Town’s treatment lagoons. 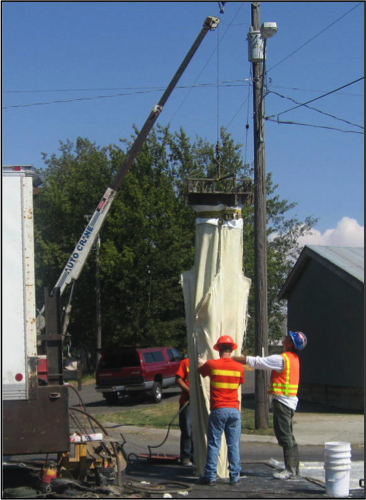 TD&H Engineering designed and constructed a metal pole building to house electrical panels, generators, and other equipment related to the operation and maintenance of the sewer system. All plans and specifications were prepared in accordance with the Washington State Department of Ecology Criteria for Sewage Works Design (Orange Book).